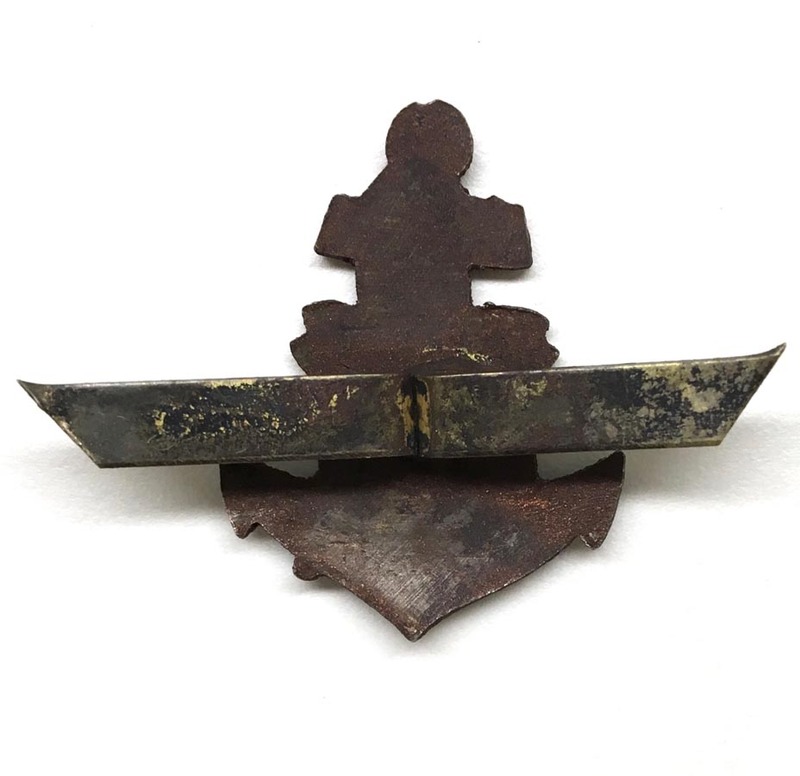 PHYSICAL DESCRIPTION: This Japanese Imperial Naval Landing Forces Hat Insignia is in excellent condition still retaining it's original fastening prongs. 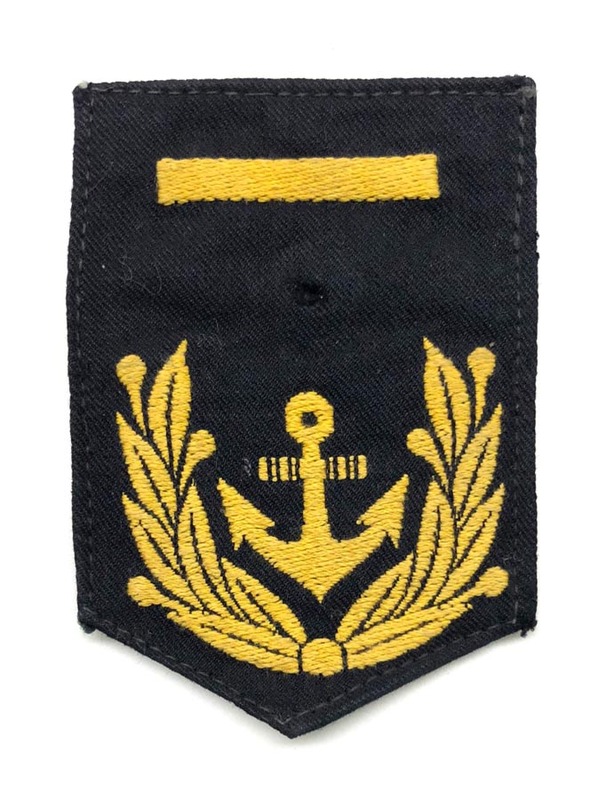 PHYSICAL DESCRIPTION: Sleeve rank badge is in nice condition. Showing no damage. 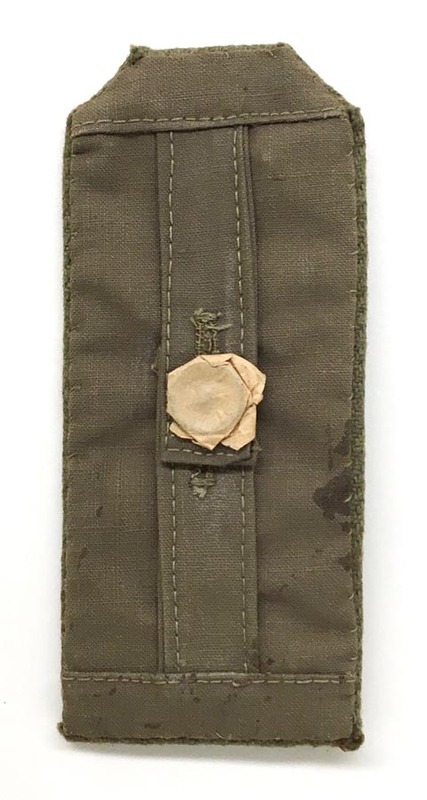 There is a small hole to center where the service branch pin was once located. 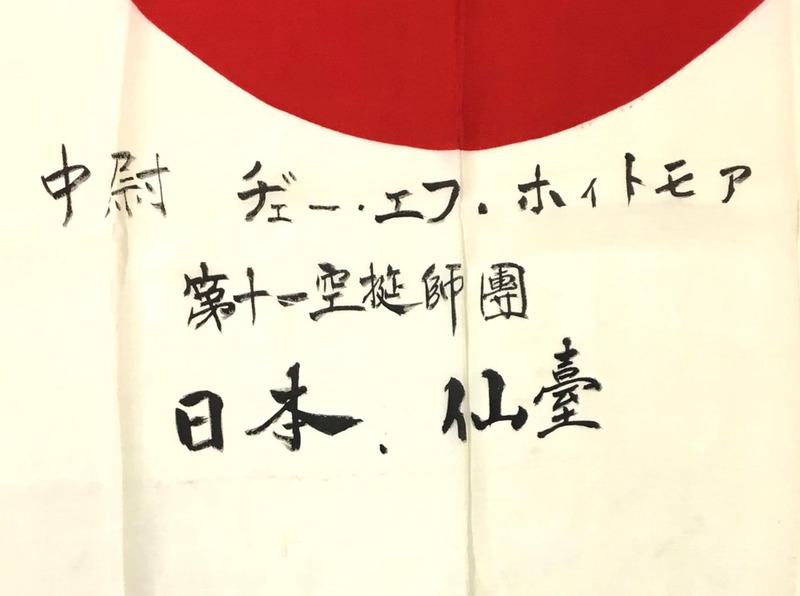 PHYSICAL DESCRIPTION: This WW2 Japanese cloth helmet star is in nice condition showing some evidence of once being sewn on. 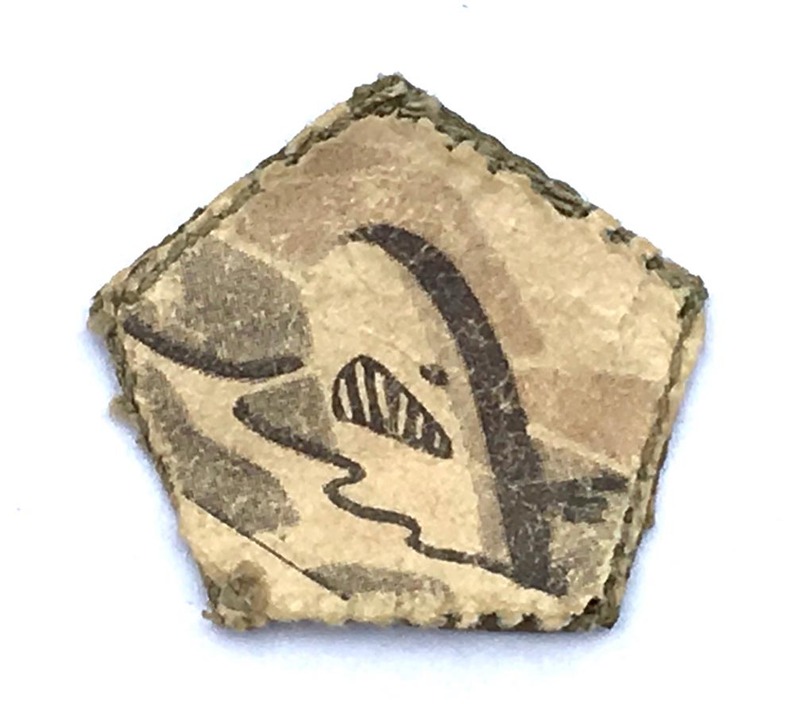 The paper backing is kinda neat showing what appears to be a shark surrounded by waves. 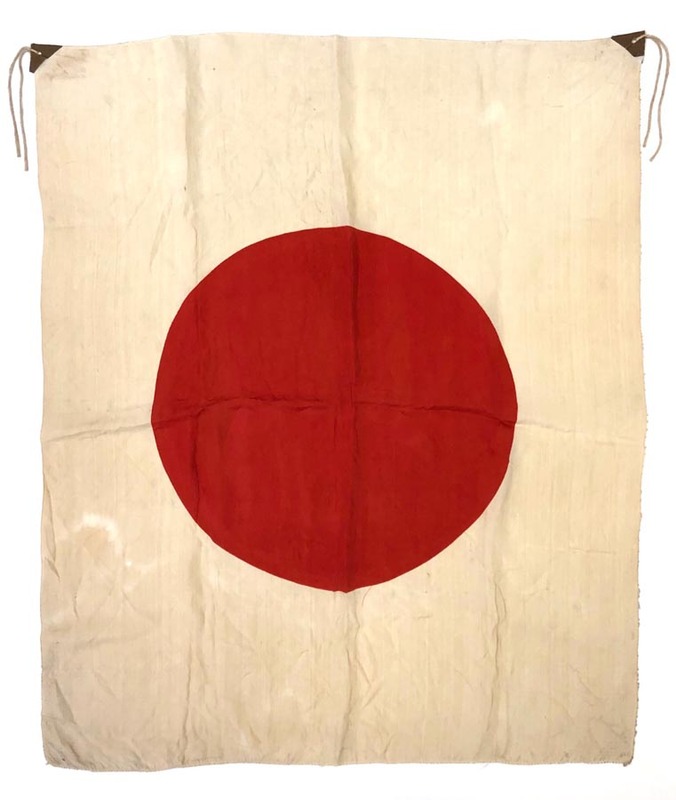 PHYSICAL DESCRIPTION: This WW2 Japanese cotton signed National Flag is in nice condition showing some wear and age. 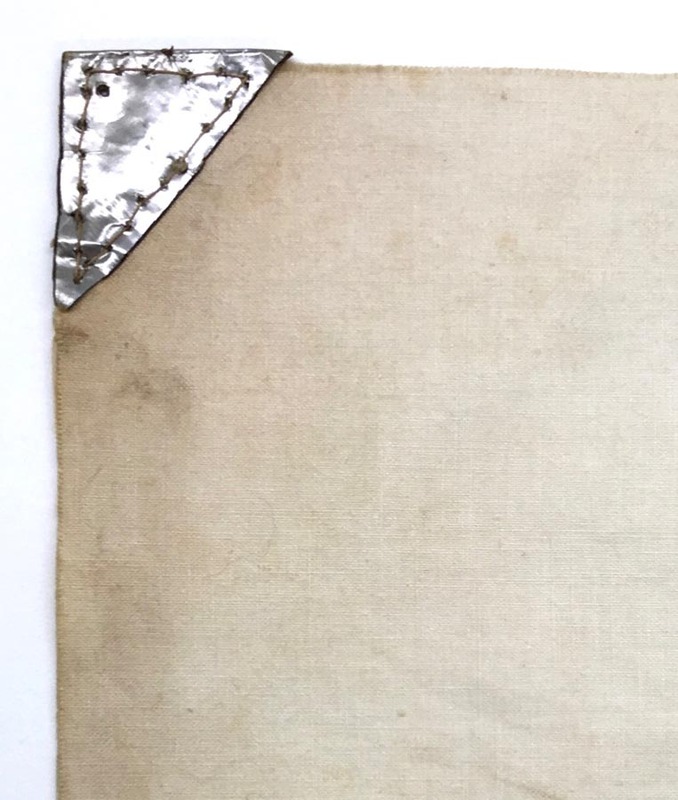 Both paper corners are intact. 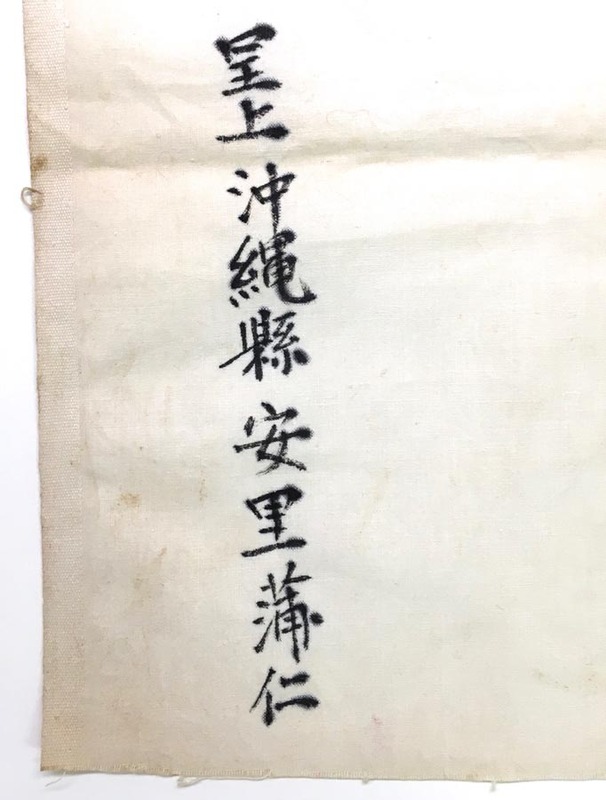 Flag shows some soiling. 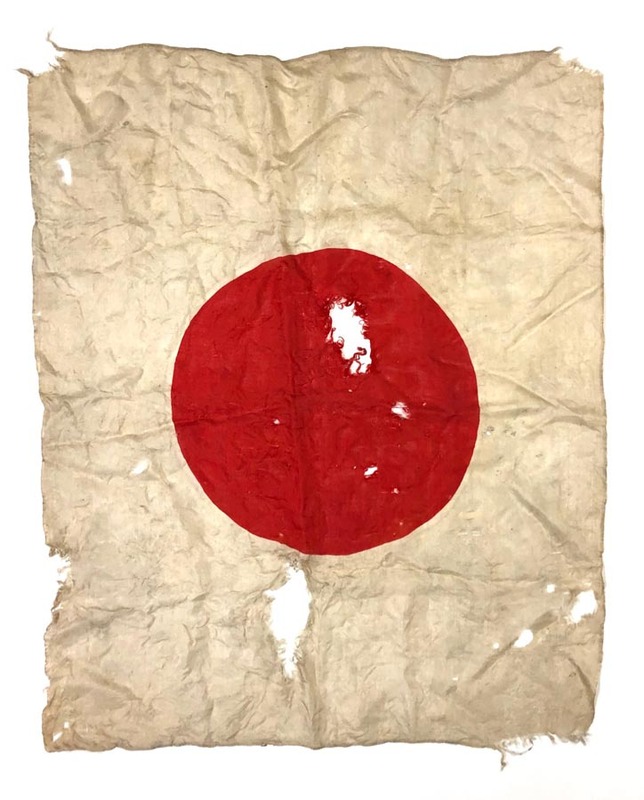 PHYSICAL DESCRIPTION: This silk Japanese National flag is in nice condition showing little wear. 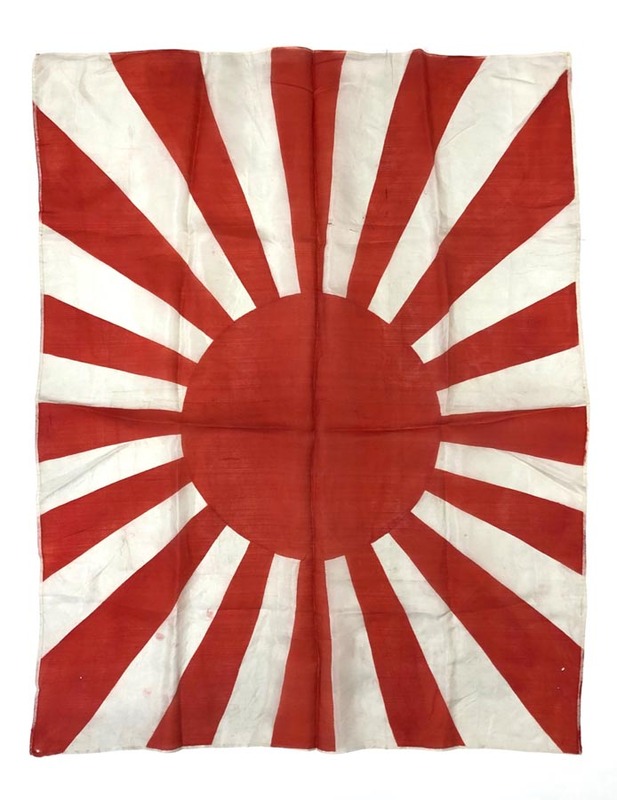 Flag measures approximately 29 inches by 35 inches. 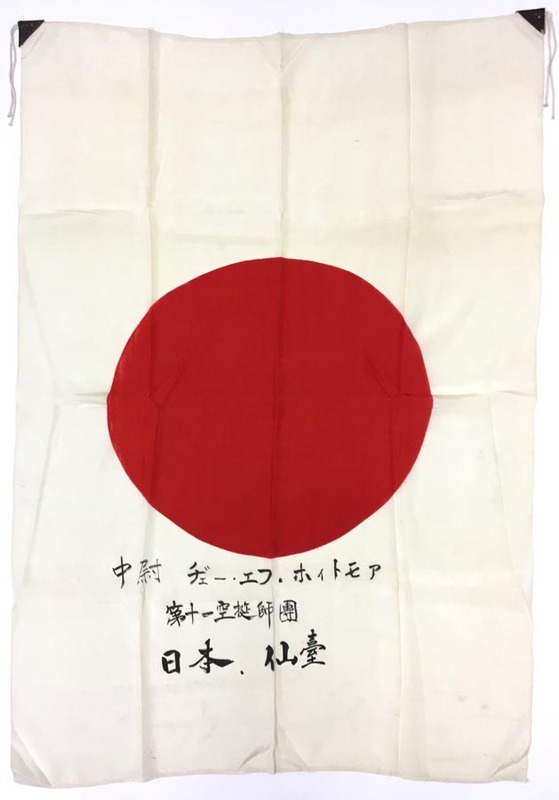 PHYSICAL DESCRIPTION: This silk Japanese signed National Flag is in excellent condition. 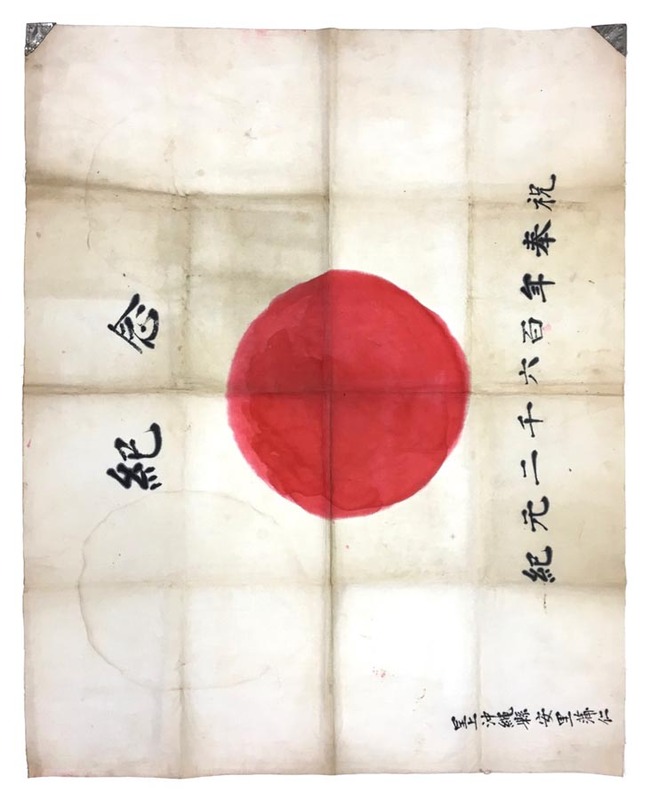 Flag measures 28 inches by 41 inches. 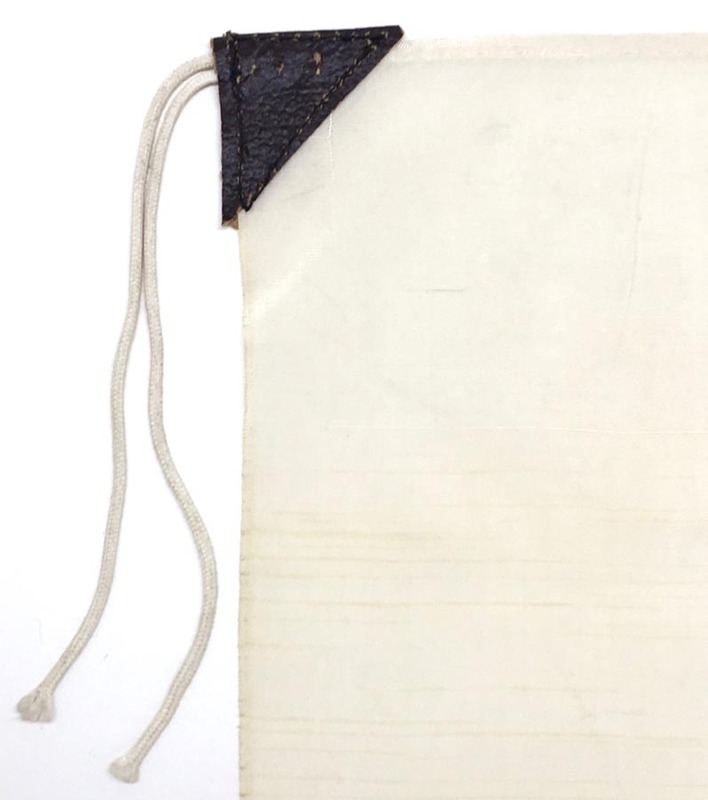 Both corners with tie strings are present. 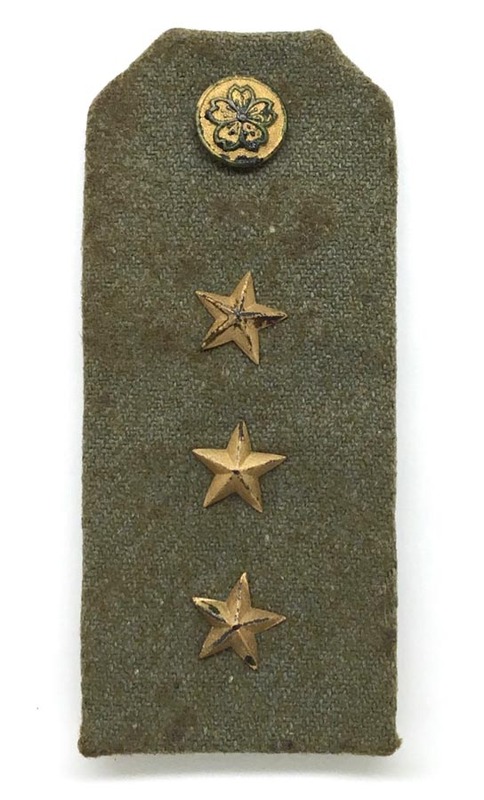 PHYSICAL DESCRIPTION: Japanese shoulder board in nice condition showing some age. 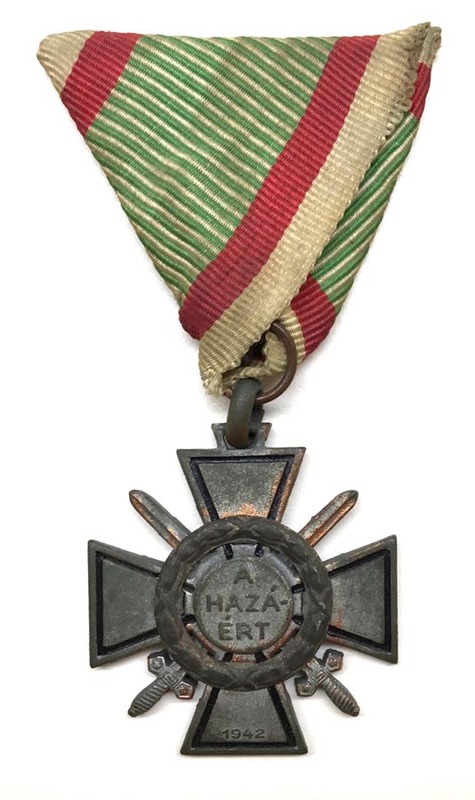 PHYSICAL DESCRIPTION: This WW2 Hungarian Fire Cross Medal is in nice condition showing some wear and age. 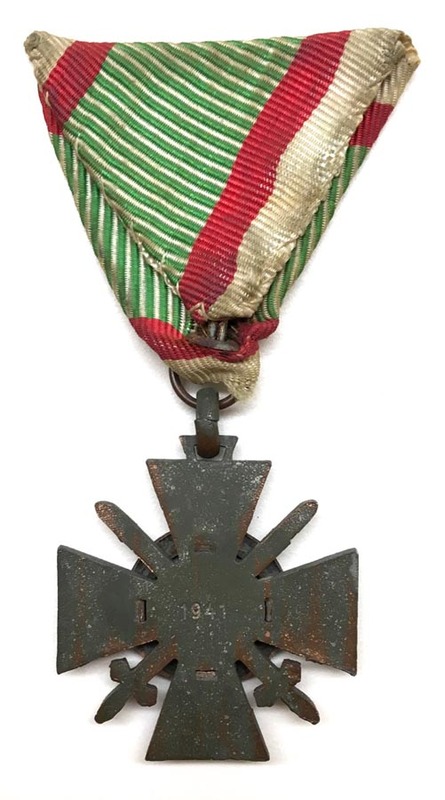 Cross is dated 1942 to front and 1941 to reverse. 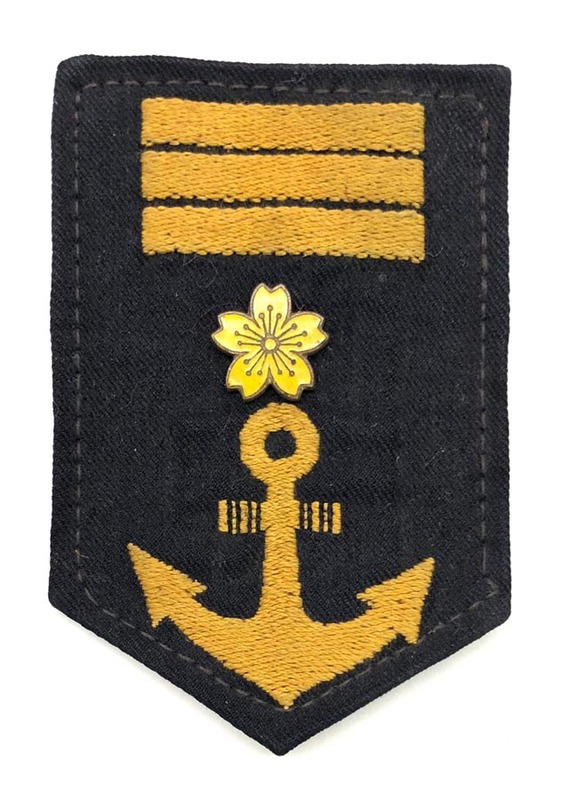 PHYSICAL DESCRIPTION: This Japanese Naval Sleeve Rank Badge is in nice condition. Enamel mum has only one attachment prong. 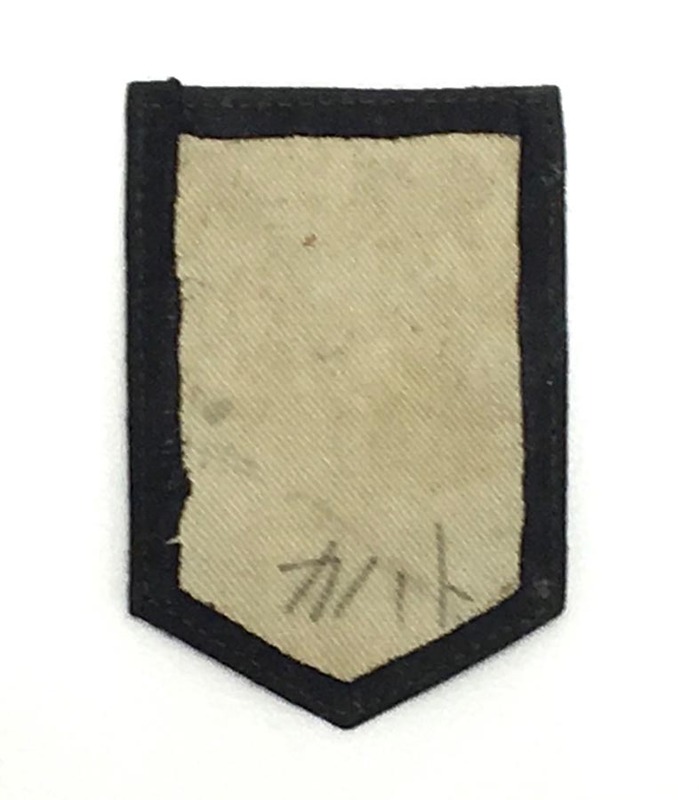 PHYSICAL DESCRIPTION: This Japanese Naval Sleeve rank Badge is in nice condition showing some very light wear. 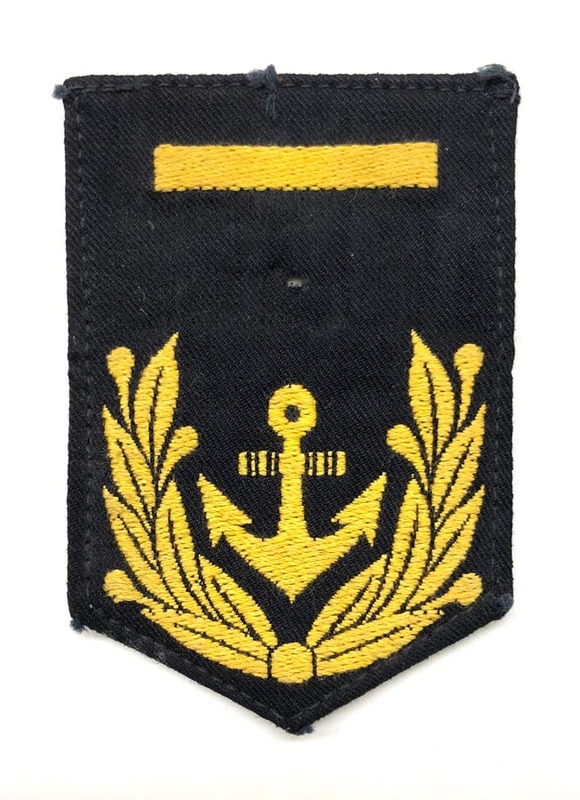 Badge shows evidence of having a service color mum badge. 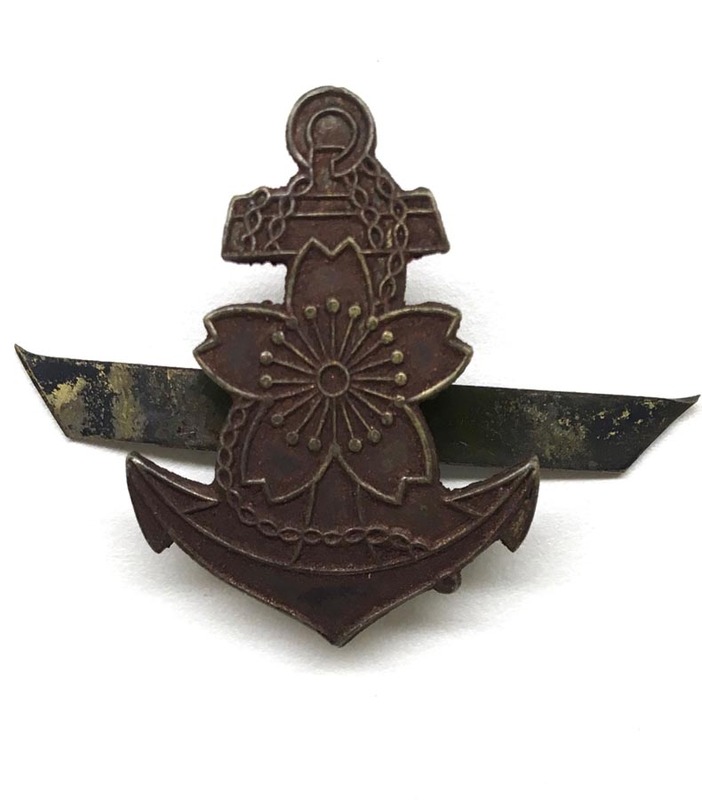 PHYSICAL DESCRIPTION: This Japanese Naval Rank Badge is in nice condition showing some very light age and wear. 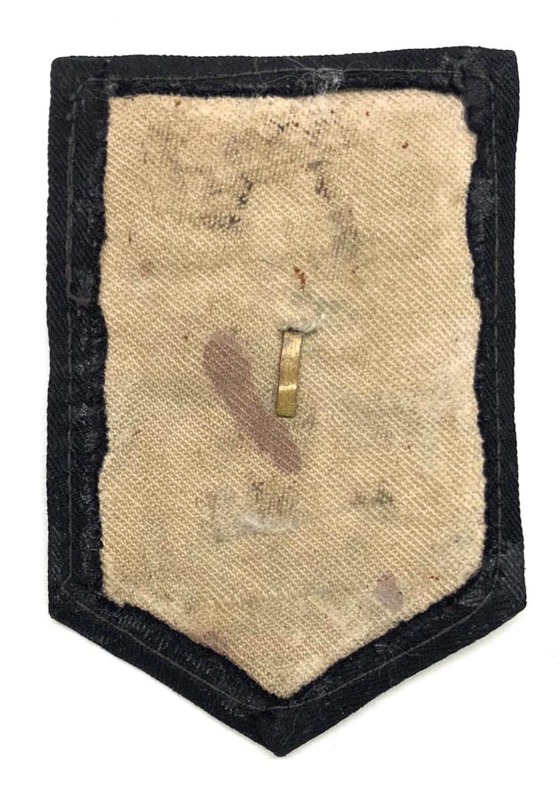 Badge shows evidence of once having a service color mum badge. 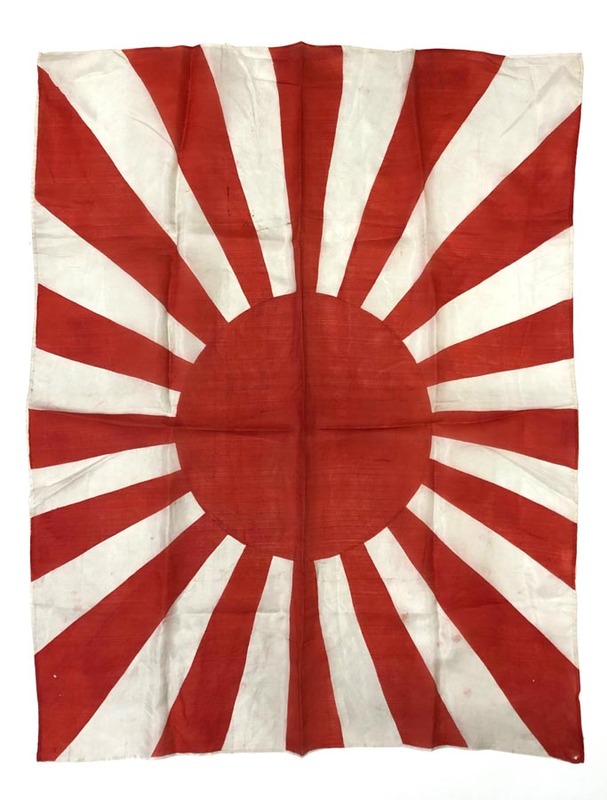 PHYSICAL DESCRIPTION: This WW2 Japanese Rising Sun Silk Flag is in real nice condition. 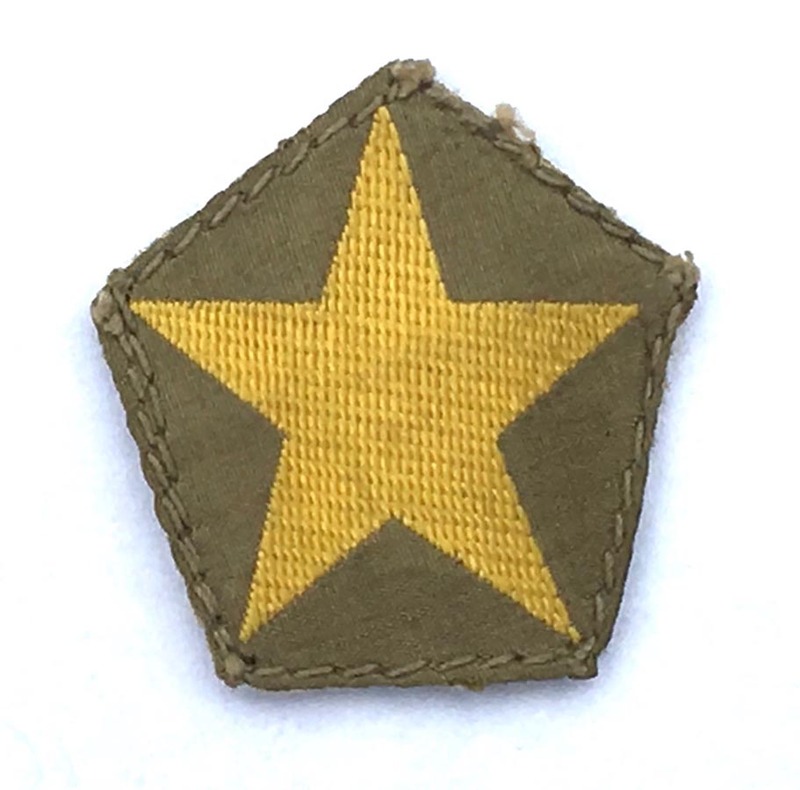 Flag has two small holes about 1/8" of an inch across and two pinhead size holes. 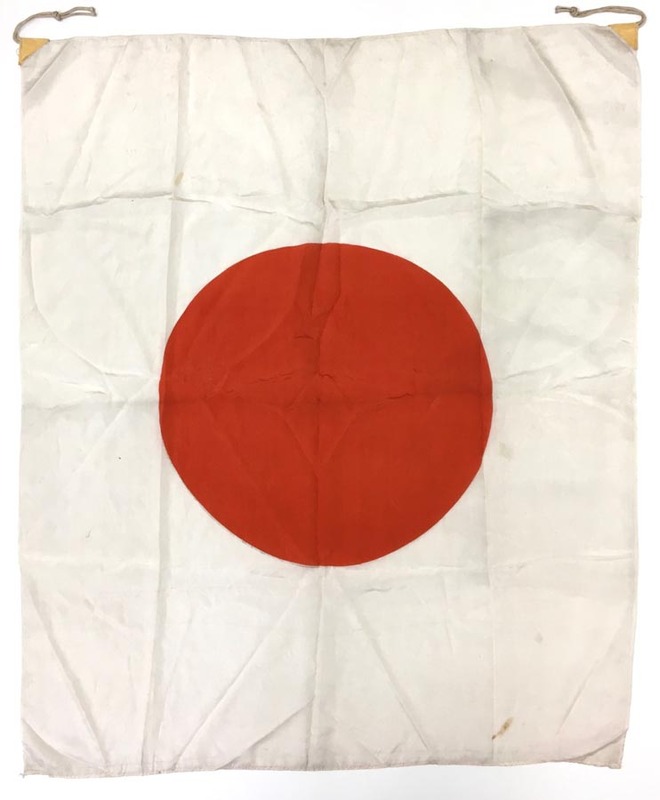 Flag measures 27" by 35 1/2". 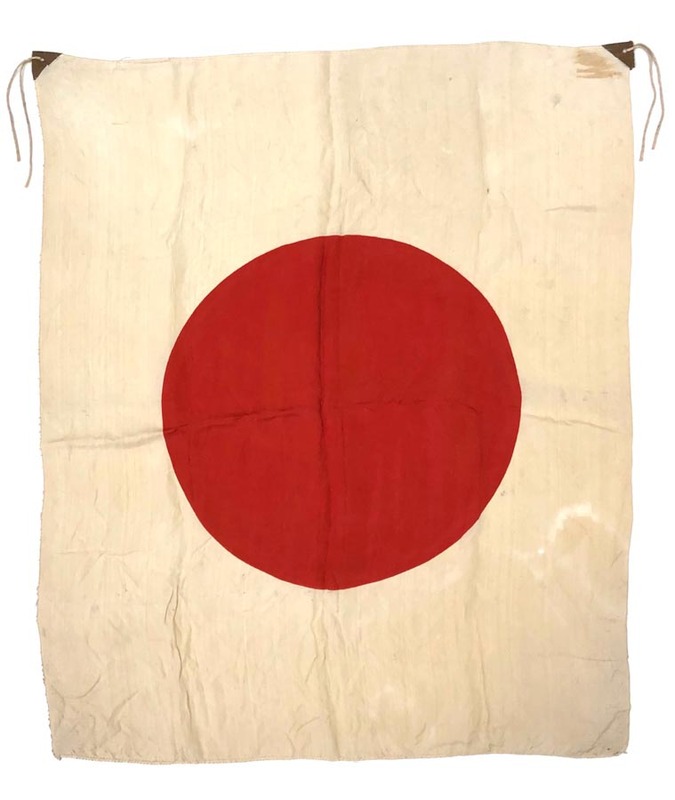 PHYSICAL DESCRIPTION: This WW2 Japanese Silk Meatball Flag is in real nice condition. 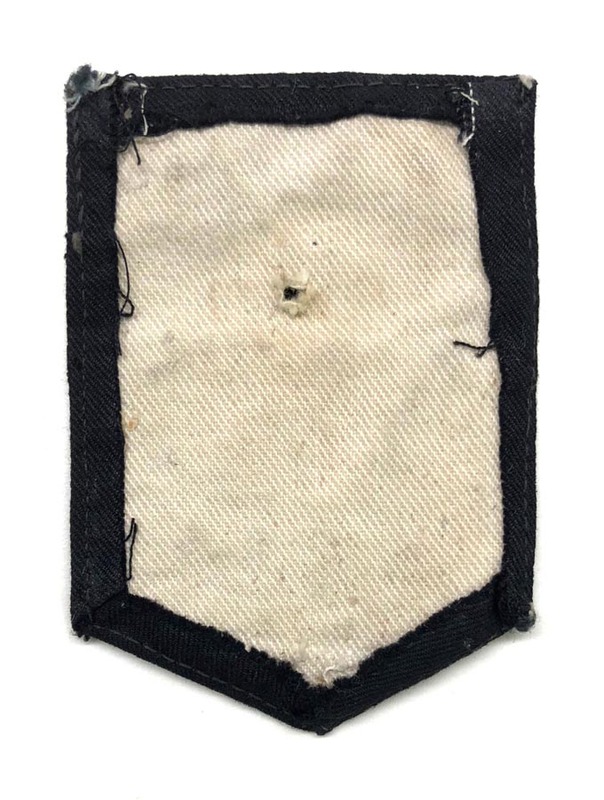 Flag has one tiny hole about 1/8" across and one tiny pinhead size hole. 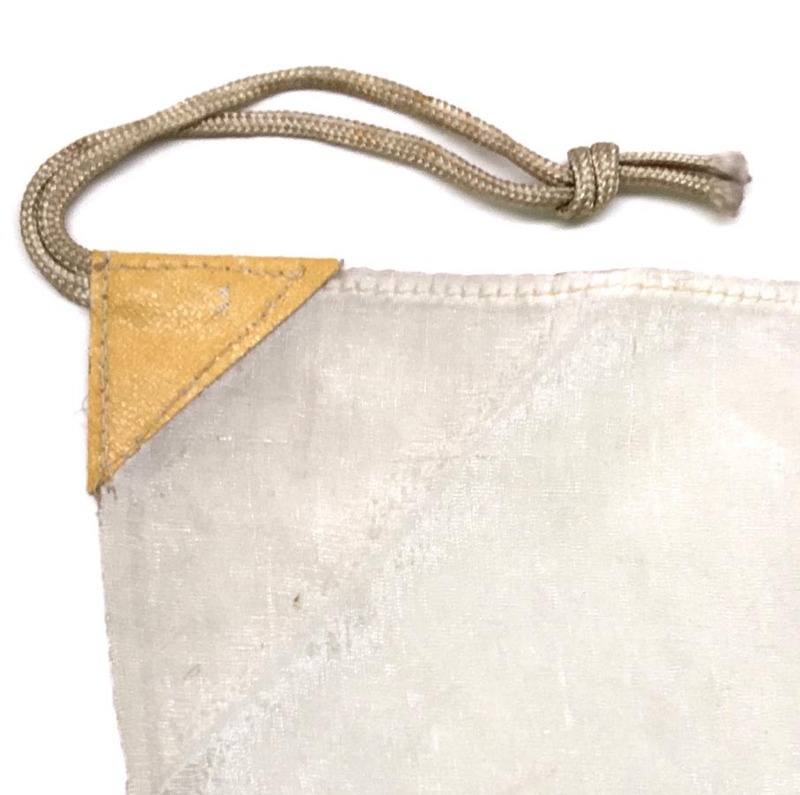 Flag measures approximately 26 1/2" by 32". 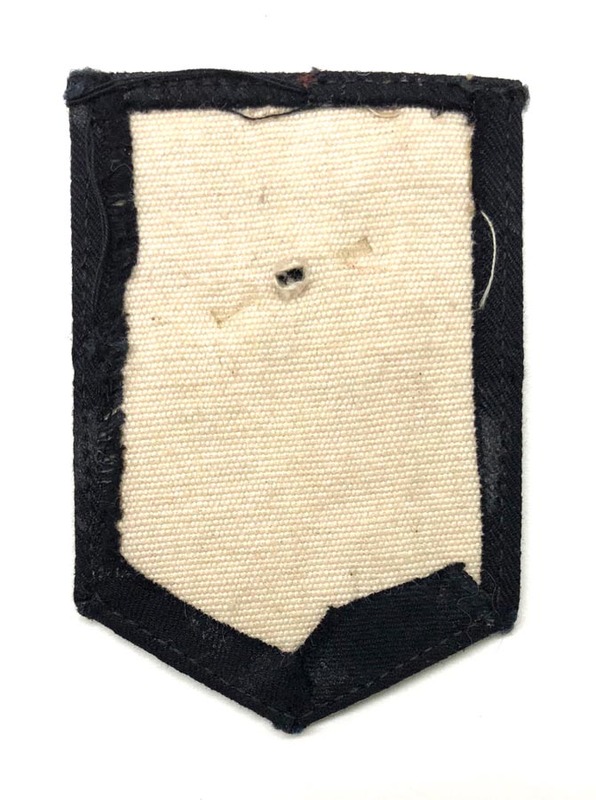 Flag has both corner ties. 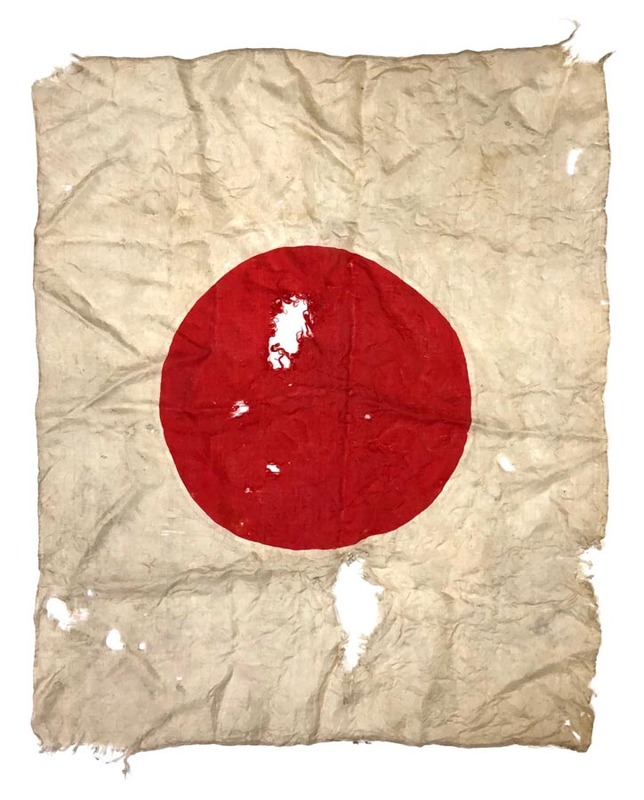 PHYSICAL DESCRIPTION: This WW2 Japanese Silk Meatball Flag is in fair condition showing much battlefield damage. 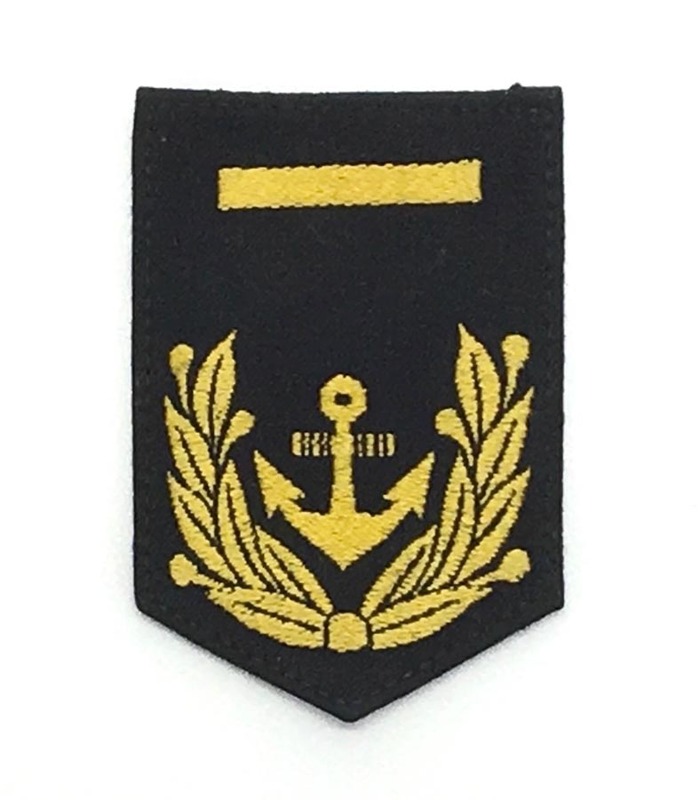 Flag measures approximately 27 1/2" by 33".